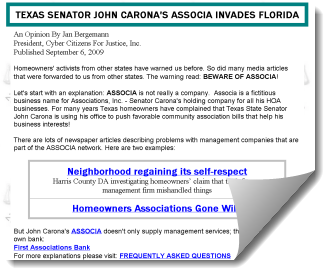 HOA Blogs Archives - Page 2 of 5 - Neighbors at War! 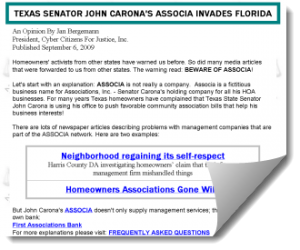 A Total Collapse of the American HOA? No Comments on A Total Collapse of the American HOA? 15 Comments on North Austin Homeowners Decide to Quit Being Stoopid! Hallelujah! It took years, but members of the Sunchase Condominiums in North Austin have decided to quit being stupid. Sunchase homeowners have been paying dues for years, but their HOA board and the property manager, Nancy Thompson, refused to show them the books! Last time I looked, Texas law mandated that HOA members be allowed to see where their dues are going. Homeowners have poured more than a million dollars down a black hole that hasn’t been audited in more than five years. Readers of this blog know that I’ve got a very low tolerance for the stench rising from tens of thousands of HOAs in almost identical situations. And Sunchase stinks to high heaven! Dear Lord God, I Love These Stories! No Comments on Dear Lord God, I Love These Stories! How could I live if I didn’t occasionally run across these stories and have the ability to mock them? But God is good, and He sends me lots of links. The Massapequa Park Village Board has decided that unmowed lawns are more of a safety hazard than letting child rapists roam the streets. That’s right, folks. Let your grass grow an inch longer than your neighbors, and you could soon be slapped with a 10,000 dollar fine. Let’s spell that out, so there’s no mistake about the zeroes: A TEN THOUSAND DOLLAR FINE. No Comments on Katy Did! Katy Did! Yep, I know that’s an insect, an annoying little insect. Wikipedia says katydids disguise themselves brilliantly as dead rotting leaves complete with holes in them. I do strain for metaphors once in a while, but an HOA manager in Katy, Texas, disguised himself as a worthless piece of dead, rotting debris when he decided to steal a million dollars from his neighbors. 34 year old Taggert Mayfield pleaded guilty to money laundering, scoffing at his fiduciary dutues, and bald-faced theft from homeowners who profoundly trusted him.